This is England 1973, and fifteen year old Rebecca Budde is in love with Dave. After one glorious summer, Rebecca is forced to move with her family to Brightley, a village with a puddle for a pond, and no excitement at all. If only Dave were there. Very weird things are going on inside their new house, and even stranger things are happening in the village at night. Someone appears to be living in Rebecca's wardrobe. Someone else is on the balcony, trying to get in. Things don't make sense anymore as Algernon Keats steps from the shadows, his sister not far behind him. There's no Dave, two ghosts, a pub, a dog and Alex March, a dark and brooding artist, living in the Manor House down the road, whose interest in Rebecca is both puzzling and thrilling. What do Alex and Algernon want from Rebecca? What on earth does any of it mean? Is it possible to love a ghost? And what happens if he loves you back? The lights are out. Welcome to Brightley. Rebecca thinks love is forever, but sometimes it's not. And nor, sometimes, is death. 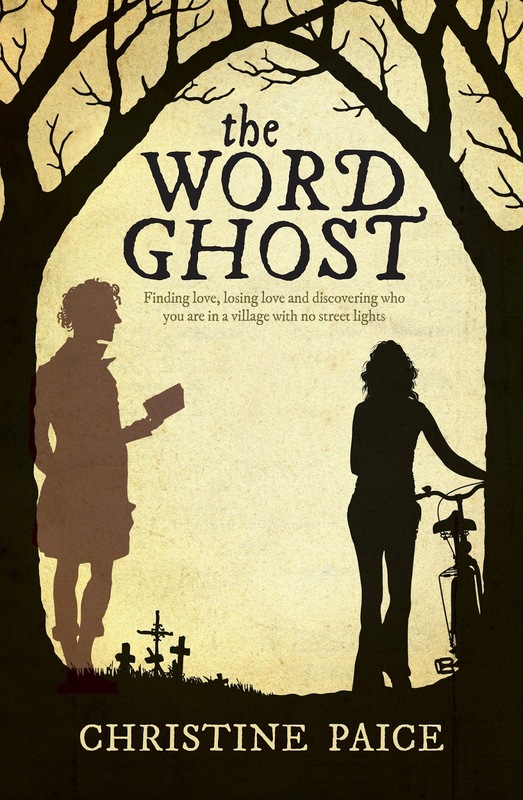 The Word Ghost is a funny, moving story about what it means to find love, lose love and discover who you are when you live in a village with no street lights and a decidedly dark side. For almost sixteen year old Rebecca Abraham Budde, it's the year of flared jeans, Jane Eyre, the small town by the river and Dave. Dave with this long ginger locks at the bus stop, in which Rebecca rides past everyday. But being the local Vicar's daughter, as her budding relationship with Dave begins to bloom, her world is turned upside down. The family are moving to the sleepy town of Brightley, after her father is accepted as the new Vicar at Buckingshire Parish. Older sister Maggie will soon be of at college, while younger sister Emily couldn't care less where she lives, but Rebecca knows that this may just be the end of her romance with Dave, the boy that's no doubt The One. The new Vicarage is over a hundred and seventy years old and seemingly comes with a very welcoming neighbour, the elderly Flora Shillingham. At the small cottage, it's the tapping on the balcony window, the dreamlike figure that kneels beside the bed and the eerie fog that rolls in each night that make Brightley different from other small country towns. Rebecca is miserable, even studying her great love of literature does nothing to aide the heartache of missing Dave, but when she returns to Wye to see him, things don't go as well as she had expected. But she still has Algernon Keats for company, the twenty four year old ghost that passed away and now inhabits her wardrobe. He's the cousin to the famous poet and see's the beauty in the world, including that of Rebecca. Algie recites poetry, he drops pebbles and leaves from his body and smells of fresh soil. He wants for nothing and speaks in riddles, but he's the closest person Rebecca now has to a friend in the strange town. But where Algernon is light, Augusta is dark, the ghost that taps on her balcony doors. If that wasn't enough to keep Rebecca occupied, she now has to fend off the local womaniser, the eccentric and wealthy artist Alex March. Alex is developing an obsession with the girl that is twenty years his junior, and before she knows it, Rebecca is swept up in his passion. This will be the year of finding love, losing love and giving yourself to another. To finding the truth in poetry and seeing the light beyond the shadows. Brightley is more than a town with a rich history, and Rebecca is about to find out why. The Word Ghost was a storyline told in two parts, the first half was beautifully written, incredibly charming and instilled a dream like whimsy in readers. The second half sadly seemed to have lost it's way. Rebecca was a charming and quirky young lady, she's sassy, intelligent and has an incredible internal monologue that not only provides the reader with random observations, but she also converses with Jane Eyre. It was so refreshing just to read about Rebecca's day to day life without unnecessary drama, she's a brilliant character who has more than enough personality to keep your attention. I really enjoyed how at each new phase of her life, she lists what she's accepted and what she's rejecting. From David Bowie to biscuits, it was charming and I fell in love with her character even more so. But as she moved into the new town, I felt her character begun to lose that magic. The reader is introduced to Algernon Keats, cousin of the famous poet who's father was also a Vicar in the same cottage more than a century ago. Algie, as he's affectionately known, is simply lovely. He recited poetry, and uses Rebecca's journal to create his own. Why he's taken to Rebecca isn't exactly known, but together they create a sweet and endearing friendship that I wish had of been delved into more. Meet Alex March, the thirty seven year old brooding artist that lives down the road. He first shows an interest in older sister Maggie, who is of legal age, but once Maggie moved to London for college, his interest shifts to the underage Rebecca. He was incredibly creepy and had a sinister presence within the storyline. But when Alex's creepy interest turns into something far more than appropriate or legal for that matter, Rebecca's initial magic has all but disappeared. I was disappointed and really not sure what his role was, apart from chasing an underage girl to seduce. Personally, The Word Ghost would have been far more enchanting without the introduction of Augusta, who seemed to be seeking retribution for her life before she passed, and Alex, who's storylines both entwine. I'm not sure there was an underlying message to the storyline though, more so a coming of age story with the paranormal sprinkled throughout. Partly magical, somewhat disturbing and beautifully poetic, but definitely worth giving this one a read. Alex March = I have the heebie jeebies. Dude, that's creepy if he's liking little girls. Um. Nope, no thanks. And also very sad when books kind of drag for the second half. SO SAD. Oh dear, it's a shame that the second half of the novel seemed to be much more disappointing than the first half. I do not think I will bother to pick this one up, but will still keep it on my radar.